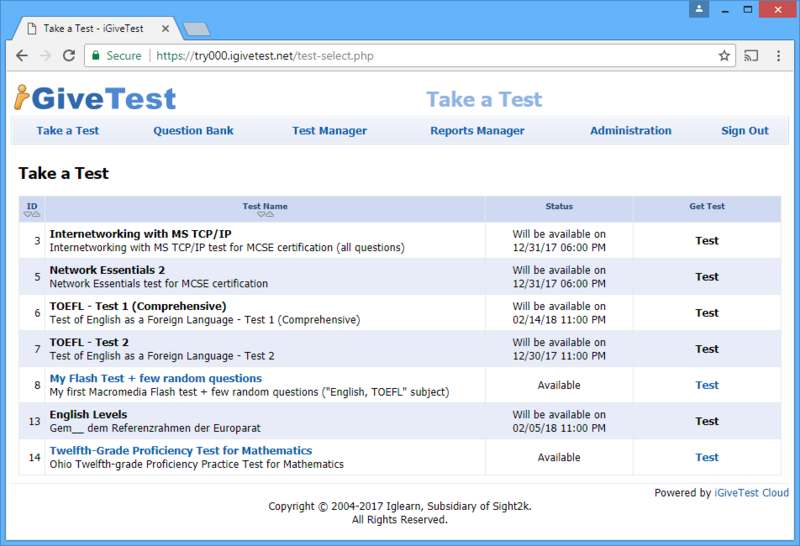 iGiveTest is a comprehensive solution for creating, administering, and providing thorough analysis of tests (quizzes, assessments, or exams) on the Internet and Intranet. You can easily list all your questions and format the text, add graphics, formulas, animation, and audio and video files. Ability to create templates allows you to set up a style for your tests consistent with that of your Web site and gives your test a professional look. 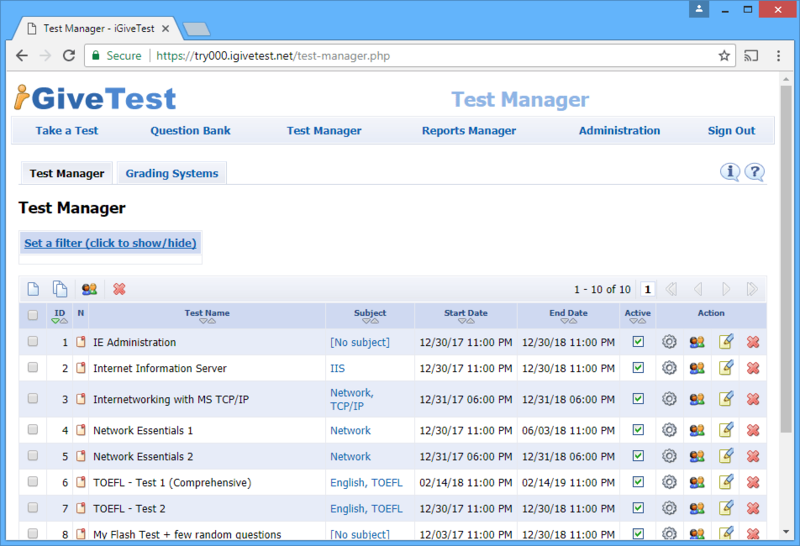 It is a quick and professional way to create and organize tests for employees, students, and people in training. The iGiveTest system is developed in PHP 5 (PHP 7) programming language. The system depends on neither the operating system used on the Web-server, nor the type of the server. Only PHP 5.2.0 or higher versions are needed (custom editions supporting PHP down to 4.1.2 are available upon request) along with any widespread tool for database management (MySQL, MSSQL Server or Oracle). These operating systems have been tested successfully with iGiveTest. Other operating systems should work equally smooth. For managing and working with an iGiveTest website, a browser of any type can be used. If you want to use the additional features of the HTML editor, you would need Internet Explorer 5.5 (or higher), FireFox 1.0 (or higher), Google Chrome 2.0 (or higher), or Mozilla 1.3 (or higher) to ensure proper work of the editor. 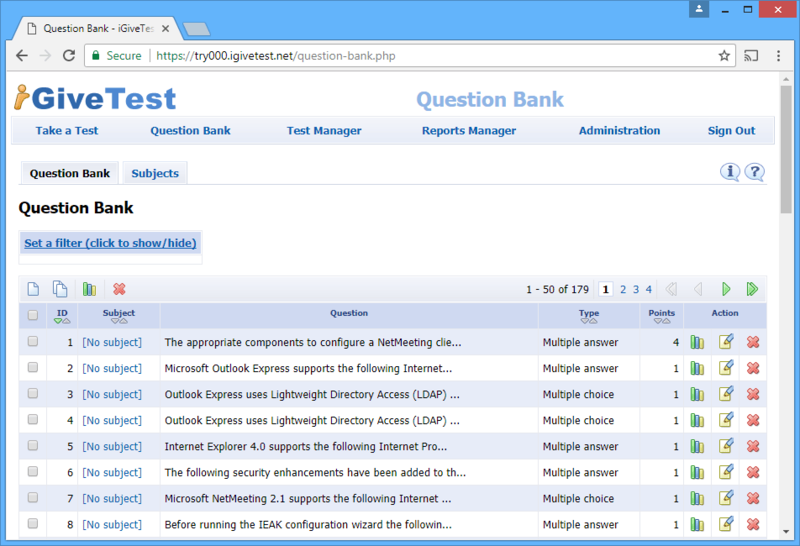 You could use iGiveTest wizard utility to easily install and configure iGiveTest software. Moreover, we will be glad to setup iGiveTest software on your website at absolutely no charge. We provide professional and rather inexpensive services of custom development. We will be happy to develop practically any kind of updates, as well as additional plug-ins for iGiveTest or other related software. We provide services of development and integration of the iGiveTest system design with your website design. It is also possible to organize iGiveTest's interaction with any program solutions of third-party firms. Please, contact us and we will be happy to estimate the cost of the service for you for free.